A member of the Religious Congregation of Mary Immaculate Queen since 1972, Fr. 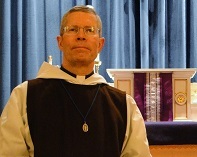 Benedict brings many years of teaching experience to the seminary. In addition to teaching, he travels regularly to bring the Mass and sacraments to souls who otherwise have no Mass to attend. Fr. Benedict is the rector of St. Joseph Seminary and will teach Latin and math this year. Fr. Augustine entered Mater Dei Seminary and upon completing his priestly training, he was ordained in 2017 and has been a staff member at SJS since August of 2017. Fr. Augustine also travels often to bring the Mass and sacraments to starving souls an this year he is teaching History and Physical Education.